If your looking for a fabulous centre piece for any room, here it is. 8 beautiful glass shades in perfect condition around a lovely detailed gilded frame. Stunning and very elegant. Since photographed this piece has undergone a full restoration and re wire and test. 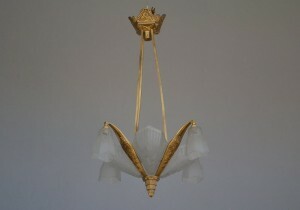 A fabulous original French art deco chandelier. For more details please call 01257 473688. 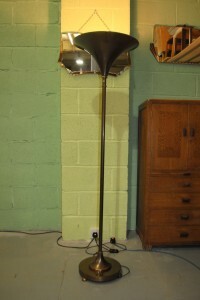 An original art deco brass uplighter. For more details please call 01257 473688. 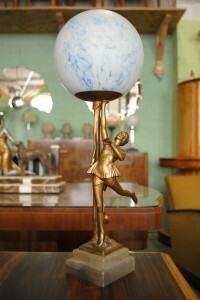 An original beautiful Spelter lady lamp holding aloft a blue/white marbled glass globe and stands on a stepped marble base. This is a very detailed figure and all in great condition. For more details please call 01257 473688. 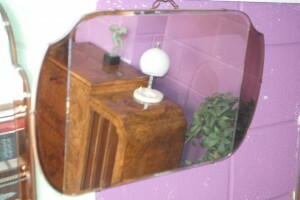 An original super rare art deco ‘batwing’ ceiling light. 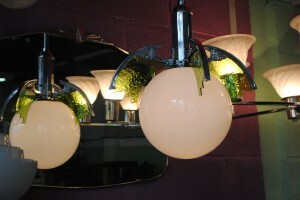 The 4 chrome wings holding the beautiful shaped green glass around the white glass shade look amazing. This is a very striking and unusual light. For more details please call 01257 473688. 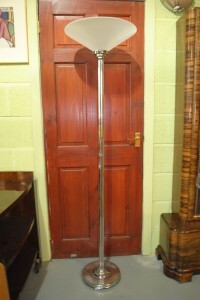 An original art deco chrome standard floor lamp in fantastic condition. For more details please call 01257 473688. 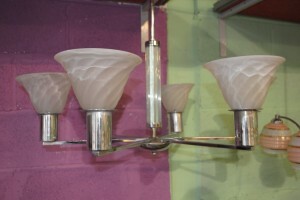 An original art deco 6 arm Chrome chandelier with white glass shades and reflective glass centre column. For more details please call 01257 473688. 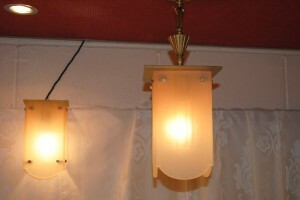 This matching set includes a ceiling light and one wall light. 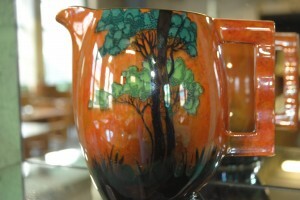 They look great and are totally original, very art deco. For more details please call 01257 473688.